Don't Waste our future! SAVE FOOD: Global Initiative on Food Loss and Waste Reduction - Don't Waste our future! 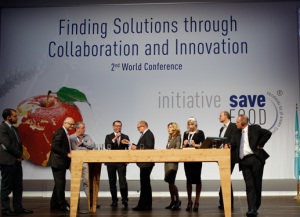 The SAVE FOOD Initiative will present itself for the third time now this year on the occasion of interpack in Düsseldorf. At the international SAVE FOOD Congress on 4 May 2017 speakers from business, science and political spheres and civil society will get together to shed some light on the various facets of the food waste problem. India will be one focal theme this year. In addition to a talk delivered by the Indian Minister of Food Processing Industries, Harsimrat Kaur Badal, a new SAVE FOOD Study will be presented that has analysed the status quo of food losses in India using various case studies. As a Special Forum operated by the trade fair, the Innovationparc will again be entirely dedicated to the SAVE FOOD theme this year. Here partners and members of the SAVE FOOD Initiative present their studies as well as sector or company-specific initiatives. Furthermore, the Innovationparc provides a setting for expert exchange and networking. Further information on the agenda and speakers will follow shortly.